Keep Eureka Beautiful | More trees, please! Our mission is to educate all sectors of the community about the importance of beautification, and to motivate individuals to take personal responsibility for making Eureka a more beautiful, livable city. 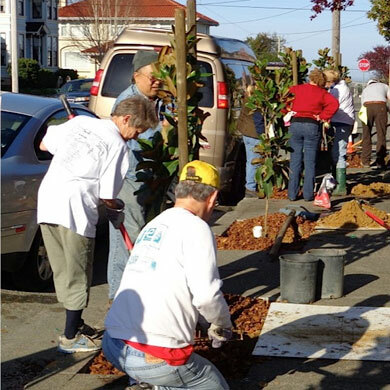 We work with residents, the city and elected officials to promote our goal of making Eureka a city of tree lined streets. As an all-volunteer effort, our effectiveness depends entirely on our commitment to working collaboratively with a host of community members and organizations. Beautification is non-partisan, so we enjoy working with the full spectrum of our wonderfully diverse community. Do you want trees in your sidewalk? 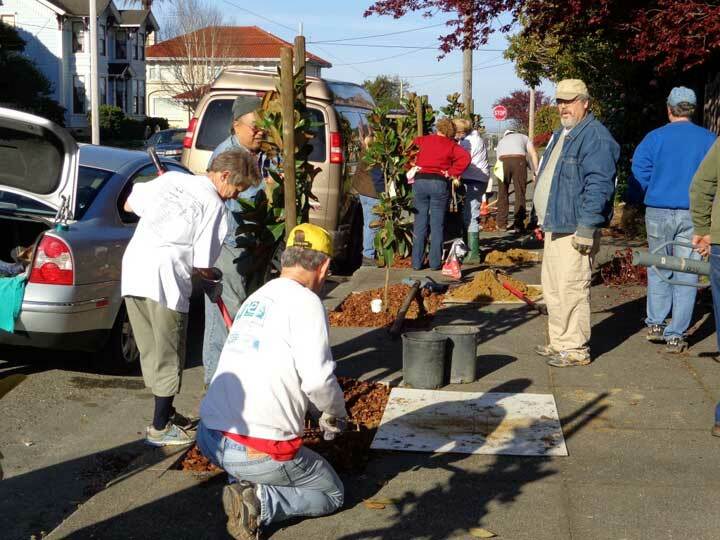 Keep Eureka Beautiful will arrange for the sidewalk cutting, buy a tree and plant it for only a $75 dollar contribution to offset some of the costs. You just water and care for the tree after it’s planted. If you are interested in having trees planted, email us at info@keepeurekabeautiful.com. In Portland, researchers found that homes with street trees sold for an additional $7,130 on average. Just being within 100 feet of street trees added $1,688 in value. Trees capture rainwater in the soil, reducing the sediment, pollutants, and harmful bacteria that flow into our water. 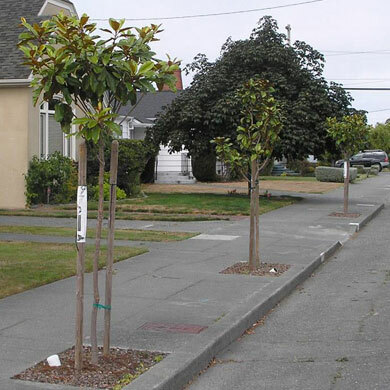 One street tree can intercept 1,525 gallons of storm water. Street trees have been shown to reduce driving speed by an average of 3 miles per hour. Narrow lanes and street trees also reduce the severity of car crashes. Research has shown that communities with trees are stronger. People say they feel safer and like where they are living more than in neighborhoods that have few trees.